PNB Housing Finance launches the initial public offering (IPO) on the BSE today. 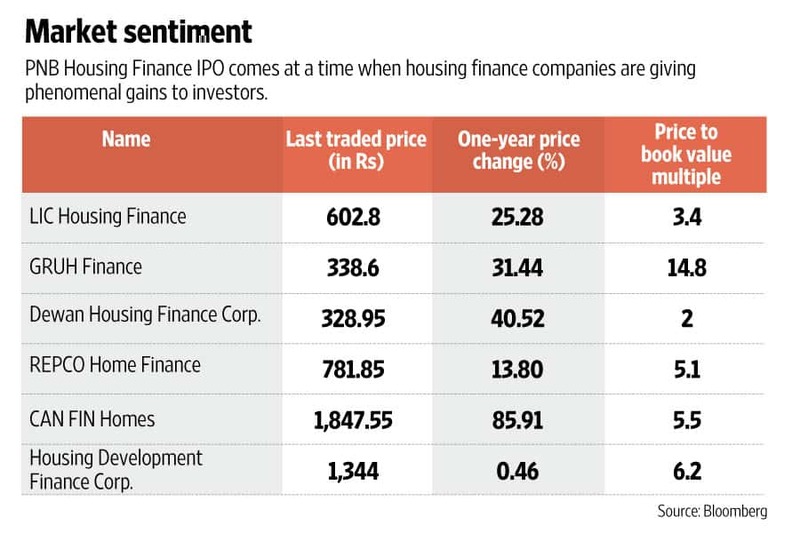 Shares of housing finance companies (HFC), especially the mid-sized, have given phenomenal returns to investors over the past one year. These companies have shown stellar growth in their businesses. Most of the nine listed HFCs, excluding behemoth Housing Development Finance Corp. Ltd, have expanded assets under management by at least 30% and maintained impeccable asset quality over the last one year. It is in this sweet spot that PNB Housing Finance will become the 10th HFC to list on the stock exchanges on Tuesday. PNB Housing Finance, too, is a mid-sized home lender in expansion mode, having grown its loan book at a compound annual growth rate of 62% over the past four years. The lender’s asset quality is enviable with bad loans a minuscule 0.29% of the total loan book on a gross basis as of the June quarter. That Quality Investment Holdings (a Carlyle group firm) owns 49% in the HFC has alleviated concerns over governance that investors typically tend to raise in the case of a public sector parentage. Given the deep housing deficit in India that throws open an opportunity to home lenders, HFCs will continue to catch the fancy of investors. Home loans are considered the safest products that have the lowest delinquency ratios. It is no surprise that most analysts have recommended buying into the lender’s initial public offering (IPO). But, is the price the lender is asking from investors reasonable? At the price band of Rs750-775 set for the IPO, the HFC has valued itself around Rs12,800 crore. At the upper end of the price band, the stock’s post-issue valuation would be 2.4 times the book value of 2015-16. It will depend on the comparison as valuations of HFCs are all over the place. Compare the lender with Can Fin Homes Ltd or Gruh Finance Ltd, and PNB Housing Finance looks like a steal. Can Fin Homes is trading at 5.5 times its FY16 book value while Gruh Finance is the most expensive, trading at nearly 15 times its FY16 book value. But Dewan Housing Finance Ltd is trading at twice its book value, which makes PNB Housing Finance seem a tad expensive. Religare Securities notes this and adds a note of caution that PNB Housing Finance is unlikely to show growth similar to the pace of the past five years. Further, the lender’s construction finance loans grew the fastest and 18% of its loan book comprises loan against property. Both these do not augur well for asset quality. Nevertheless, given the prospects of the housing finance business, picking PNB Housing Finance may seem right for the long term.